Joder! Hace Calor! Looking for a refreshing way to cool down? 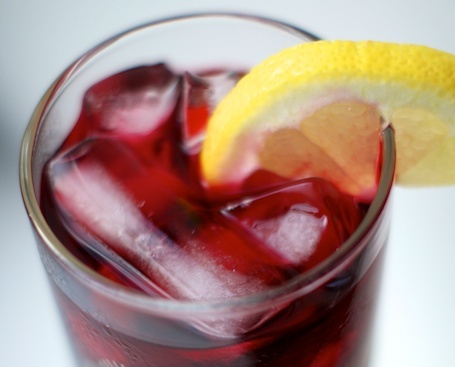 I recommend mixing up a pitcher of Agua de Jamaica, a simple and delicious hibiscus infusion. Over the years, we have incorporated a number of dishes brought to us by our daughters’ babysitter, Julieta, who hails from Puebla, Mexico, and is an excellent cook. In the summer months, she is never without several aguas frescas in her refrigerator and our kids can’t get enough of them. So we have started to make them, too, as they are really easy and a nice alternative to juice and lemonade. 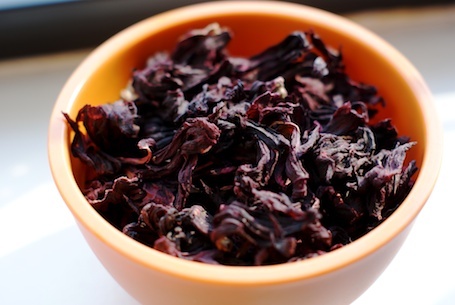 Take two cups of dried whole hibiscus flowers, which you can find in a health food store or order online here. 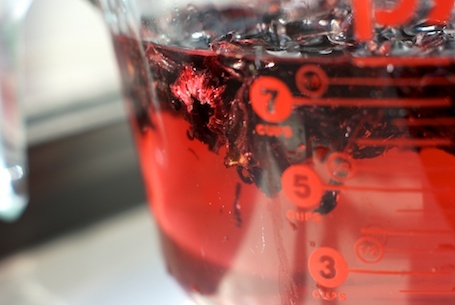 Add the hibiscus flowers to 8 cups of fresh, cold water. Cover and let sit overnight. In the morning, strain the flowers through a cheese-cloth lined sieve into a bowl. 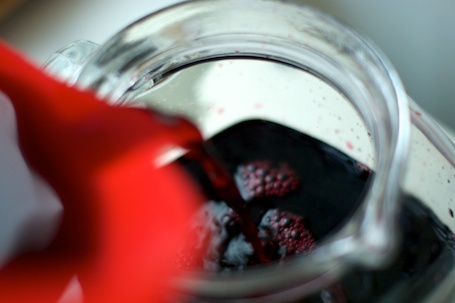 What do you think of this arty photo depicting the pouring of the aqua into a nice glass pitcher? Don’t answer that. But that is what you do next. Here is where you can add a sweetener of your choice. Most recipes call for 1/2 – 3/4 cup of sugar, but I think you can get by with a lot less. Honey works, but it takes awhile to mix in. If you are in Jamaica, you can add rum. Frankly, at this point, you can doctor it up any way you wish, but it is really just excellent on its own, lightly sweetened, over ice. 1/2-3/4 c. sugar, or sweetener of choice. This entry was posted on July 22, 2011, 2:11 pm and is filed under Recipe. You can follow any responses to this entry through RSS 2.0. You can leave a response, or trackback from your own site. We call it carcadè, it was very popular when Italy had its colonies in Eritrea and now you can buy it readymade. I never thought of it as being made from real hibiscus petals! I’m also a big fan of hibiscus. I’m using one from http://products.mercola.com/hibiscus-tea/ Has anyone tried it?